Please note: This entry has been revised to include the photo of Margene Sullivan. We regret the eror and saythanks to all for their help with this, especially the folks at Atlantic Shores. Additionally, they have pointed me in the direction of many talents residents. More about them as the months unfold. This is the headline for an article I recently found about extraordinary folks at Atlantic Shores Retirement Community in Virginia Beach, VA. The story goes on to highlight a number of the residents emphasizing that much of their desire to become creative aka, in this case visual artists, came about later in their lives, stressing the personal joys and fulfillment they are finding through their art. These extraordinary senior artists are definitely not in the minority. One can find and celebrate them in every community. Even though Older Adults Month officially comes to an end today, I plan to continue to seek out and applaud these people’s imaginative nature, and skills. I can’t resist adding this picture of Margene Sullivan…”one who didn’t find her creative side until later in life and is now one of the most talented pastel artists in the community.” Margene: You Go Girl!!! 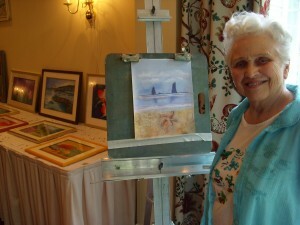 Thanks Lynn for saluting our Atlantic Shores resident artists. Margene and her fellow artisans are amazing!